Runnaway garbage scow. One man working by himself? Aren't there labor laws prohibiting one man being expected to work by himself? An insurance liability indeed if anything happens to them. Carnival Cruise just needs to close up shop. Flood the hull, it won't go anywhere. Maritime legends: "death ships, "ghost ships". 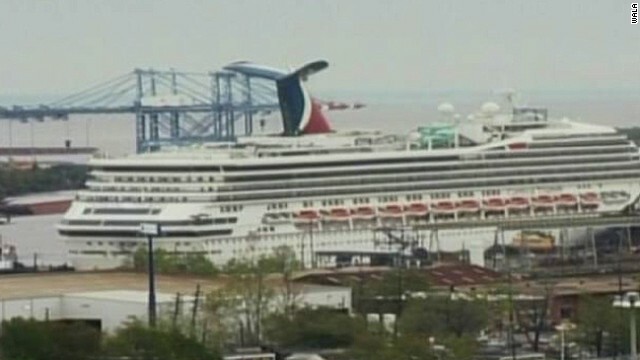 This ship now has a history and it would not surprise me that once it is repaired, I doubt that Carnival will scrap it, they will probably just rename it! This ship is cursed and should be delivered unto Davy Jones locker lest she afflict innocent others. Be warned! It’s bad luck to change the name of a boat, but if you must, best to write the soon-to-be-exorcised name on a piece of paper, fold the paper, and place it in a small cardboard or wooden box. Burn the box. Scoop up the ashes and throw them into the sea on an outgoing tide. If you live on a lake, do it at night and only during a new moon. River dwellers should send the ashes downstream. Now that the ship is loose at sea, shoot holes in it and let it sink. Carnival cruise lines should start a new slogan "The ship that gets you there on time, well, sometimes, well, rarely. OK, never".